The Toro Power Max 826 OXE snow blower is very similar in snow throwing capacity as the Toro Power Max 726 OE snow blower, as they can both process up to 862 kg (1900 lbs) of snow per minute. The clearing width on the Toro 826 OXE is also the same as the clearing width of the Toro 726 OE. It comes in at 0.66 m (26 inches) allowing you to attack large swathes of snow very quickly. Inside the 0.66 m (26 inches) wide opening, sits the auger. It’s a Power Max type auger. It’s a 0.36 m (14 inches) serrated steel auger that quickly and efficiently chops up the snow and feeds it towards the steel impeller. The steel impeller blade is 0.3 m (12 inches) wide and enhances the throwing ability of the Toro Power Max 826 OXE dual stage snow thrower by forcing the snow through it at rapid speeds. The throwing distance of the Toro 826 OXE maxes out at 13.7 m (45 feet). This is a massive amount of force and care should be taken when operating it so as not to damage things or hurt people. The engine on this Toro dual stage snow blower is a 0.25 liter 4 stroke Briggs and Stratton that is started either by the built in recoil starting mechanism or by an electric starting switch that operates off mains electricity. The friction disk transmission used on the Toro Power Max 826 OXE snowblower gives the machine 6 forward speeds and 2 when reversing. This power is then transferred to the wheels that can be operated independently allowing the operator to make hairpin 180 degree turns with little effort. Once the snow is sucked into the Toro 826 OXE by the auger, then it is expelled out of it’s strong steel deflector chute that is controlled via Toro’s trademarked Quick Stick system. This is a quality snow blower that you will frequently find in use by professionals and less so with regular homeowners. 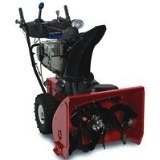 Click Here to buy the Toro Power Max 826 OXE Snow Blower.